While working with a college baseball team, most players (pitchers especially) would come in to get their shoulders stretched. These stretches usually included internal rotation, external rotation, and biceps stretch. Fast forward two years later, I had a discussion with an ATC about the damage that could possibly be done when stretching any athlete in external rotation of the shoulder. As a student, I took this as an opportunity to learn. The thought is that external rotation of the shoulder will irritate the labrum, biceps tendon, or the undersurface of the rotator cuff. Also, if an athlete is being stretched into an extreme external rotation this could simulate a peel-back mechanism. This increases anterior capsular laxity and likely exacerbates the internal impingement mechanism over the long-term. So for example, if a pitcher is concerned about lack of external rotation these options above could help improve it, but also according to an article written by Phil Rosengren called Should Pitchers Stretch to Increase External Rotation?, he claims that pitchers tend to gain external rotation throughout the course of a season. Improving the external rotation throughout the season occurs by just throwing and lots of it (within reason). 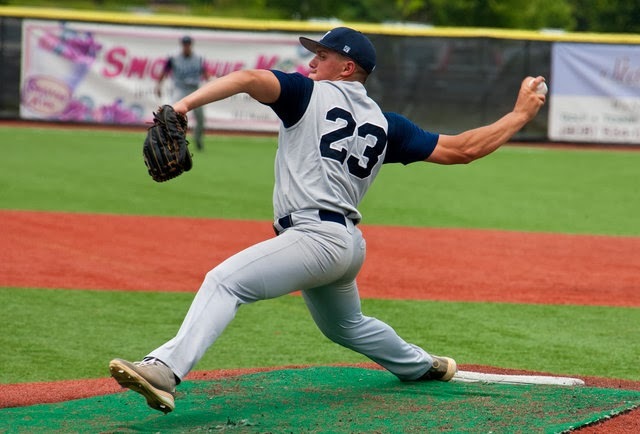 Throughout the course of the season, it’s normal for pitchers to develop greater external rotation as a product of the repetitive throwing. Rosengren’s thoughts are when actively stretching your arms where it’s already getting loose on its own doesn’t make much sense. You are creating and increase amount of instability in the joint and putting the athlete at greater risk of injury. Rosengren states that increased flexibility and range of motion are good. But, only if accompanied by increased strength and stability, which is pretty agreeable. So, if you repetitively stretch out your arm and ignore working on strengthening the muscles around the joint, you’re asking for trouble. So in a pitchers throwing arm, greater range of motion in the shoulder is good, but this should be accompanied with stability in the scapular region.